What is a SIPOC Process Map? A high-level process map is a simple depiction of the four to eight key steps within a process. The purpose of using this tool is to illustrate the importance of customer needs and process outputs being the same. The output of a process creates a product or service that meets or exceeds some expressed or implied customer needs. Construct the process map to reflect how the process currently operates (“As Is”), not how it should operate (“Should Be”). Keep the “high-level” process map restricted to roughly four to eight key steps. This model is applicable to both product and service organizations. It is a series of steps or activities that uses one or more kinds of input and transforms them into an output for the customer. Everyone takes inputs from suppliers, adds value through their process and provides an output(s) that, at a minimum, meets the customer’s need(s) and related critical-to-quality requirements (CTQs). All jobs encompass three roles for the job holder: the customer who receives inputs of information and physical goods, the processor who converts these inputs into products (outputs), and the supplier who delivers the resulting products to customers. This concept is called the triple-role concept. Thus a product development department has three roles: as an internal customer of the marketing department, the product development department receives information on customer needs; as a processor, product development creates designs for new products; and as a supplier, it furnishes specifications to the operations department to create the new products. The figure below shows how an organization identifies the actions to be taken in each role to pursue continuous improvement. A SIPOC diagram is a tool used by a process improvement team to identify all relevant elements of a process improvement project before work begins, and helps to define a complex project that may not be well scoped. SIPOC stands for supplier, input, process, output, and customer. It’s a high-level map showing a process’s supplier, the inputs received from them, and the process that adds value to those inputs. That process produces an output that meets or exceeds customer requirements. This model is applicable to both product and service processes. Everyone takes inputs from suppliers, adds value through their processing steps, and provides an output or outputs that, at a minimum, meet the customer’s needs (CTQs). Find a large wall to construct your SIPOC, or use a flip chart. Use Post-it Notes and begin by listing S-I-P-O-C.
Start by listing 4-8 high-level process steps. List the first step of the process and the last step of the process. Fill in the other major process steps. For each step in the process, always include a verb and a noun (for instance, “Complete Audit”). Do this for each step in the process. List the output of the process step. There may be more than one. List the customers that use or need the output of each step. List the input that is needed for each step in the process. There may be more than one. List who supplies the inputs. Note: The above steps correspond to the numbers noted below. 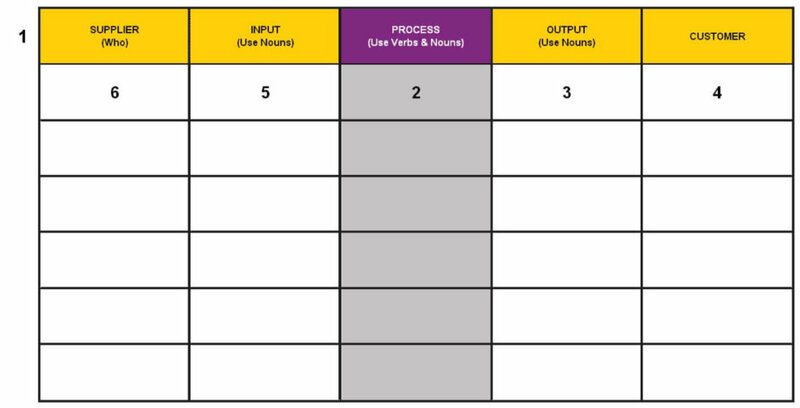 Use this template to document a process at a high-level in 4-8 steps. This template documents the Supplier steps, Input steps, Process steps, Output steps, and Customer Steps. List 4-8 high-level process steps in the Process column. List the first and last steps in the process, then fill in the other major steps in between. Always be sure to include a verb and a noun. List the output of the process step (there may be more than one, so you may have multiple rows representing the same step). List the input that is needed for each step (there may be more than one).